Beautiful, safe and non-toxic. Best selling assortment of our 10 most popular colors. Bring your stained glass projects to life! Do not shake before use to avoid bubbles. 1-oz. plastic bottles in 10 fun colors: Red, Yellow, Blue, Green, Orange, Purple, Pink, Black, Brown, and White. Protect skin, clothing, and work surfaces as this concentrate color may stain. 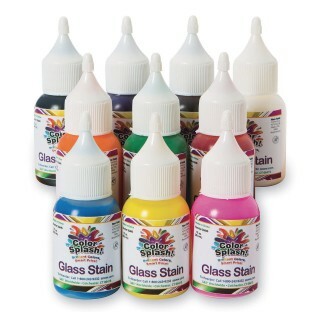 This is one of the best paint sets for using with glass stain. The bottles are easy to use and easy to store. There is a pretty good selection of colors in this set compared to other sets. I really liked the product and will buy from you again.